NEW YORK (Reuters) - A gauge of global equity markets advanced on Monday and bond yields rose as investors flocked to assets likely to benefit from reflationary policies that are expected to be implemented by U.S. President Donald Trump. Financials and banks in particular led equities on Wall Street higher as investors bet Trump's tax reform plans and softer regulatory environment will boost economic growth and corporate profits. Comments from Trump on Thursday that he plans to announce what he said would be the most ambitious tax reform plan since the Reagan era in the next few weeks rekindled hopes for big tax cuts while the announced resignation of the Fed's top bank regulator on Friday heightened expectations for a loosening of rules on banks. "Investors are willing to say the prospects for growth are higher now than they were, and they're not just saying it, they're committing capital," said Jamie Cox, managing partner of Harris Financial Group in Richmond Virginia. Investors were also encouraged by a U.S.-Japan summit over the weekend apparently having ended smoothly without Trump talking tough on trade, currency or security issues. In addition, Trump said on Monday the United States will be "tweaking" its trade relationship with Canada, stopping short of calling for a major realignment in a development likely to please visiting Canadian Prime Minister Justin Trudeau. 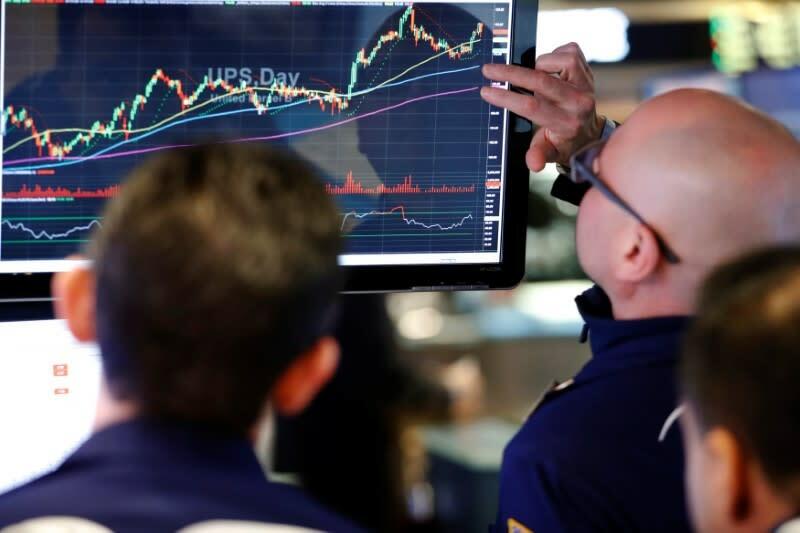 The Dow Jones Industrial Average rose 142.79 points, or 0.7 percent, to end at 20,412.16, the S&P 500 gained 12.15 points, or 0.52 percent, to 2,328.25 and the Nasdaq Composite added 29.83 points, or 0.52 percent, to 5,763.96. The advance put the S&P 500's market capitalization above the $20 trillion mark for the first time. Apple the largest component of the S&P 500 and a core holding on Wall Street, climbed 0.9 percent to a record $133.29, breaking its prior closing high of $133.00 set on Feb. 23, 2015 and giving it a market value of about $699.3 billion. MSCI's all-country world index advanced 0.49 percent to notch its fourth straight advance. Europe's broad FTSEurofirst 300 index gained 0.76 percent to close at its highest since December 2015. U.S. Treasury yields rose as investors looked to testimony by Federal Reserve Chair Janet Yellen on Tuesday and Wednesday when she gives her semiannual Humphrey Hawkins testimony before lawmakers in Washington. Benchmark 10-year notes declined 7/32 in price to yield 2.43 percent, up from 2.41 percent late on Friday. The dollar was up 0.18 percent against a basket of major currencies, after touching its highest in almost three weeks, on expectations reflationary policies would stoke economic growth and the possibility the Fed could be more aggressive in hiking interest rates. In commodities, copper hit its highest since May 2015 after shipments from Chile and Indonesia, the world's two biggest copper mines, were disrupted. The metal last traded at $6,105.85 per tonne, up 0.26 percent on the day after climbing as high as $6,204. On Friday it jumped more than 4 percent, its biggest one-day rise in almost four years. Oil prices pulled back from strong gains registered on Friday as the greenback strengthened and signs of rising U.S. crude output pressured prices. International benchmark Brent crude futures settled down 2 percent at $55.59 per barrel and U.S. crude settled 1.7 percent lower at $52.93.